The shark may seem invincible, but research has shown the creature does have predators. Among them is one that might surprise you: the giant Pacific octopus (Enteroctopus dofleini). This octopus is large enough to capture and consume small sharks. Giant Pacific octopuses are invertebrate cephalopods. They range in length from 9 to 20 feet. They have eight arms, and these arms may be 6 feet in length. Each arm can be covered with 280 suckers, each with a multitude of receptors to sense its environment and prey. The giant Pacific octopuses can weigh up to 150 pounds. Females are typically larger than males. Both can range in color from white to coral. They have short life spans, living 3 to 5 years until reproducing. Giant Pacific octopuses live in the Northern Pacific Ocean, giving rise to another name, the North Pacific giant octopuses. They range from Alaska to California to Japan, living anywhere from shallow to deep waters. They prefer rocky environments, where they can make dens to protect their eggs. Population estimates are not currently known, but they are affected by pollution. Giant Pacific octopuses are carnivores, and they hunt at night. They tear with their beaks. Prey ranges from sharks to birds. Their primary diet is composed of shrimp, lobsters and fish. The Seattle Aquarium was the stage for recorded proof of the octopus eating a dogfish, a species of shark. Seals, eels and sperm whales prey on these octopuses; the young are prey to many animals. Octopuses have excellent sight. Scientists believe they hunt by first visualizing their surroundings and then using their arms to investigate the area. 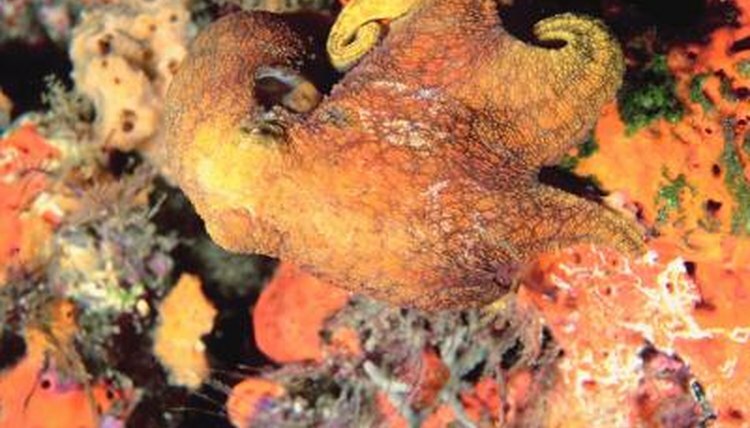 The suckers are sensitive to taste, and octopuses lunge to deliver prey to their mouths. They appear to be intelligent, as giant Pacific octopuses have shown the ability to mimic other octopuses and solve mazes. Female giant Pacific octopuses lay up to 100,000 eggs in carefully selected dens. These dens are made anywhere from rocky caves to flowerpots. Females tend their eggs carefully, cleaning the eggs and refraining from eating until they hatch. Males die soon after mating, females soon after the young hatch. Recently hatched octopuses drift in the ocean for months and develop before dropping to the ocean floor and making their homes.